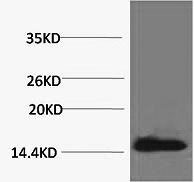 Western blot analysis of extracts from Hela cells at a 1:2000 dilution using the Phospho Histone H2A.X (Tyr142) Polyclonal Antibody. Variant histone H2A which replaces conventional H2A in a subset of nucleosomes. Nucleosomes wrap and compact DNA into chromatin, limiting DNA accessibility to the cellular machineries which require DNA as a template. Histones thereby play a central role in transcription regulation, DNA repair, DNA replication and chromosomal stability. DNA accessibility is regulated via a complex set of post-translational modifications of histones, also called histone code, and nucleosome remodeling. Required for checkpoint-mediated arrest of cell cycle progression in response to low doses of ionizing radiation and for efficient repair of DNA double strand breaks (DSBs) specifically when modified by C-terminal phosphorylation. Phospho Histone H2A.X (Tyr142) Polyclonal Antibody. Unconjugated. Raised in: Rabbit. PBS with 0.02% sodium azide, 50% glycerol, pH 7.4.